Last I tried to export as EPS. As it seems, AD is adding a margin bottom and right and the quality of the images/photos is absolutely poor as you can see on the print screen with the original file and the exported one. So I tried to export as TIFF with bicubic resampling. It could be an alternative but the quality is not as good as I expected from a TIFF export: Graphics, images but also fonts are diffuse. I would more like to export as high quality PDF or EPS file. Btw: The TIFF file can't be opened with the preview app of OS X Yosemite, it works with AD and Adobe Photoshop/Illustrator but not with Apple's preview app. When I try to export with another resampling mode, just the fan becomes challenged but the file size stays always 8Byte. I would really appreciate if you could improve the export functionality to become ready for printing press work. The PDF file will be output at the DPI of your Affinity file, so if you created it at 300dpi then it should output at 300dpi, We know about the CMYK Tiff issue with Preview and will release an update in the future. The sampling type will only have an effect if you scale your output from the design size. 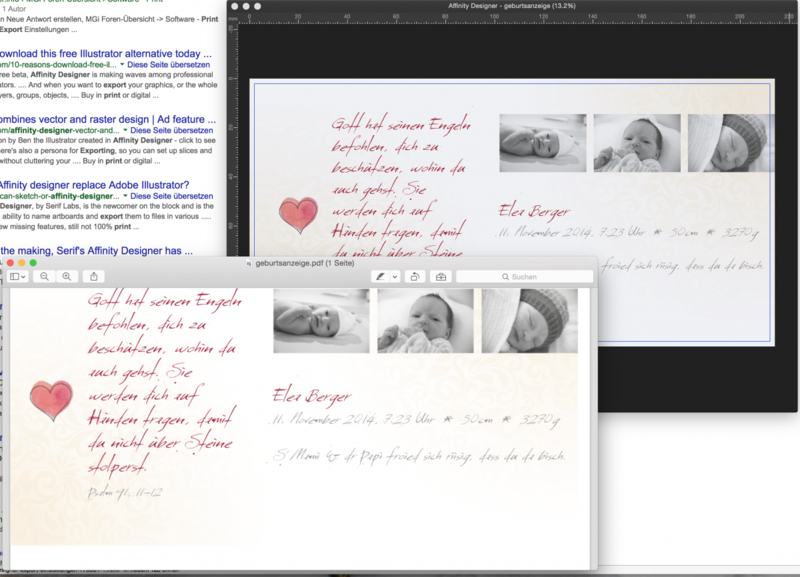 Will also plan on developing native PDF output that will give you more control of your output. You are right, will proceed so. Thanks Top Cat. Good to know that you are working on the TIFF issue and an improvement on PDF export control.